A truly authentic Brazilian dining experience! 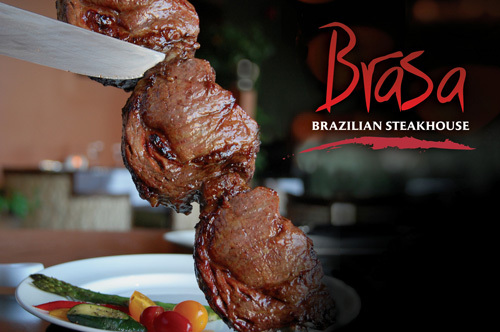 Brasa Brazilian Steakhouse brings the flavours and cultural flair of Brazil to the Hilton Hotel and Suites. Brasa encompasses a centuries-old Brazilian tradition of cooking out on the open-range.The grilling method, known as 'churrasco', is the Gaúcho way of roasting meats over pits of open fire. Many years ago in the Southern pampas of Brazil the "Gauchos" roamed the land, cultivating their land and tending to livestock. Each night brought massive bonfires for warmth and cooking, and from these fires arose the traditions of the Churrasco or barbeque. The Gauchos mastered the art of slowly cooking savory cuts of beef, chicken, pork and lamb on large skewers turned over the open flame. Nowadays, young boys learn how to grill from their fathers, becoming the caretakers of a culinary tradition passed down from generation to generation for over three centuries. 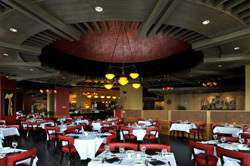 The Brasa restaurant's authenticity is an element that will raise it above competition. In fact, even the head grill master is a Gaúcho directly from Southern Brazil. At Brasa Steakhouse, traditionally trained and dressed Gaúchos serve 12 unlimited cuts of fire-roasted beef, pork, lamb and chicken tableside - also part of the tradition. 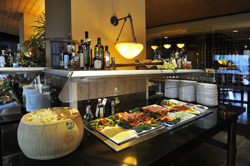 Salads and fresh grilled vegetables are offered on a buffet while traditional Brazilian sides are served family-style. Using a two-sided disk, diners control the pace of their meal. The green side signals the Gaúchos to bring skewers of sizzling fire-roasted meats to the table. The red side indicates a stopping or resting point.